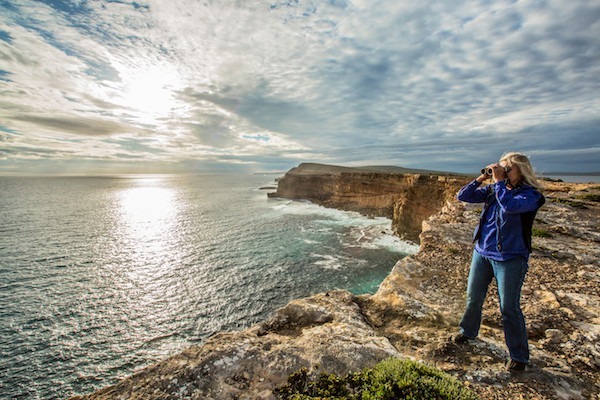 The Seafood Frontier Touring Route highlights a stand-out section of Australia’s coast, bringing into focus the water-facing communities of the Spencer Gulf, the Eyre Peninsula and the Great Australian Bight. Start at Whyalla on the Spencer Gulf, a steel city with a maritime bent whose history has been tied to mining and shipbuilding. Despite its rough-hewn past, modern Whyalla is a place of simple pleasures: wet a line off the jetty, stroll the marina or enjoy a number of excellent walking trails. On Hummock Hill, take in 360-degree views of the port and inspect Second World War gun emplacements still pointed at the ocean. Cowell, an hour-ish south, is a peaceful waterside village that doubles as one of Australia’s premiere fishing destinations. With its broad main street, tall pines and endless-summer atmosphere, Cowell’s appeal is hard to miss. South of Cowell, drop in at Arno Bay, which is renowned for its snapper. Port Lincoln, near the peninsula’s tip, was nearly South Australia’s capital but Adelaide won out. It’s a postcard-worthy place with plenty to keep visitors busy. Start with a meal at the Port Lincoln Pier Hotel, surveying the harbour and fancy boats, then walk to the Flinders monument on Stamford Hill, finishing up at the beach. If you’re peckish, relax: you’re in a place that bills itself ‘Australia’s seafood capital’. Coffin Bay, to the west, has an outsized reputation based on its superb oysters. While they hog the limelight, seals, sea lions, garfish, scallops, abalone and myriad other species also thrive here. The Coffin Bay National Park, whose coastal dunes, swamps and limestone cliffs overlook islands and reefs, begs to be explored. About those oysters: yes, they taste even better at the source. At Waterloo Bay, the people of Elliston enjoy their slice of paradise, replete with glorious sunsets and coastal views, a fine old jetty and, obviously, great fishing. Consider basing yourself here while exploring this area, which has a number of tempting day drives. Further west are the dreamy seaside communities of Streaky Bay, Baird Bay, Ceduna and Fowlers Bay.